I’ve installed TriplePlay on the homemade strat. For the last few months I’ve been working with Fishman on the documentation for TriplePlay, their long-awaited wireless MIDI guitar system, which will finally ship this quarter. I had a blast demoing TriplePlay at MacWorld a few weeks ago, and I’m looking forward to doing so again at Musikmesse in Frankfurt in April. But at times, it’s been frustrating. I power up TriplePlay to study some feature, get all excited, and then have to turn it off and write about it instead of going off and playing it for six hours. This little demo was my first real chance to just fool around with the thing. Thoughts and details after the video. I was originally going to post three “songs”: this naturalistic-sounding one with its acoustic instrument samples, an ’80s retro-electro thing, and something spooky and atmospheric. But I wound up spending all day on this one piece as I tried to wrap my head around the prospect of integrating TriplePlay the laptop-based digital rig I use with my duo band. Anyway, I’ll be posting future stuff in very different styles. • I’m not yet sure of the best way (for me) to fine-tune sounds within this system. The options are a bit overwhelming: I can customize the tone and response of my patches in the TriplePlay software, within whatever synth or sampler plug-in I happen to be using, and as a performance parameter in MainStage, my software host. You can really geek out on those settings! I sometimes have a hard time deciding whether it’s better to tweak the patch to match my touch, or tweak my touch to match the patch. • You don’t need a particularly buff computer to run the factory version of TriplePlay. But streaming some of the huge sample patches heard here definitely pushed my MacBook Air to the brink, even with my sample drive connected via Thunderbolt. (You can hear a overloaded digital crackle or two if you listen carefully.) Also, a faster machine will let me run everything with even less software latency. (This isn’t a reflection on the TriplePlay hardware, which tracks ridiculously well.) The timing will get tighter with a faster processor. • One thing that really excites me — and which is not reflected in this particular performance — is warping MIDI guitar sounds within the liquid audio environment of a modern DAW. While this cover tune was fun to play and record, it’s not especially representative of the sorts of sounds I envision creating with TriplePlay. I’m less stoked about faking a violin or harp than by the notion of creating hybrid guitar tones that blend analog pickup colors with atmospheric synths and samples. It was pretty exciting opening MainStage and seeing the analog guitar sound and wireless MIDI data appear on adjacent channels, ready for desecration customization. BTW, here’s the official word on the TriplePlay release: Before the end of March for the Mac version, with the PC version to follow soon after. In other words: Get back to work, Joe! Cool bit of tech, that. I’ll be looking forward to hearing some more esoteric processing! Looks like Frankfurt’s a bit chilly in April, but if you can bundle up I’d recommend the Segway tour of the greenbelt. How else could you see where Schopenhauer walked his poodle and the birthplace of the Euro? I never knew Schopenhauer’s poodle invented the Euro! Well, I guess they had high expectations in that family. What kind of battery goes into the pickup unit and how can you tell when it’s about to give out? I love easy questions! No disposable battery — it’s lithium-iron, rechargeable via USB. Runs about 20 hours on a charge. The TriplePlay host software has a realtime battery-charge indicator. Pretty slick. I have used flat wounds on my midi guitars in the past. I found that on my old Roland GR30 that flat wounds made the triggering a little more accurate. My new GR55 tho’ is a different story the flat wounds don’t seem to make a difference. I believe this is due to the vastly improved midi converter in the GR55. This is probably the case with the Fishman unit as well. It sounds like you will be having some fun. I really like to layer midi sounds with guitar as it makes a really big full sound that is very musical. One thing I think that gives great tone is doing bends while using the mixed synth/guitar. When you bend midi pitch it goes in 128 steps so the pitch is going in and out of synch with the guitar pitch. This creates a subtle but definite tension that can give a sometimes eerie or edgy feel. Sometimes I like to turn off the midi pitch bend so it goes from one note to the next with no bend. If you are playing slide this gives the effect of sounding like 2 players. I do this with a harmonica patch playing bluesy figures and get the audience looking for the harp player. You should try it, it takes some practice but is very cool when it is right a cheap trick but cheap isn’t always bad. There is a lot of room for inventiveness as midi guitar is sort of overlooked by most players. BTW very nice video demo, I dig B&W video (childhood thing). Accordion patches are a big fave of mine as well, I used to use it when we played the Spike Jones tune “In Der Fuhrer’s Face” that we threw a little polka break into, back in 2001 or so. You had caves? We only had ditches for our paintings. You had ditches? We just laid them flat on the ground! You had ground? We just let our paintings float around in the formless void. You had paints? We used small animals but we couldn’t even afford lines to draw inside of. These are roller wound so they are similar to the burnished strings but a little livelier. When I was young, I changed strings a lot. Sometimes more than once a week, though granted, I was putting in a lot of hours on just one or two guitars. 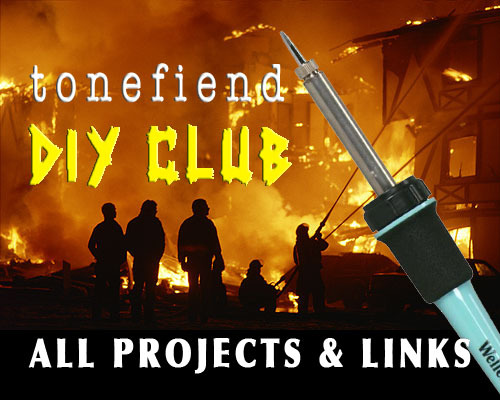 A big turning point for me was when I started playing with guys from Africa and hearing all the stories about players tying knots in broken strings to extend their life, or unraveling bicycle brake cables for wire. I’m not under any illusions that my stingier restringing habits are helping anyone in the third world, but it’s nice not to be gratuitously wasteful. Anyway, flats can last a long time! I’ll have to get a set of the golds when the family farm pays me next time. They sound like just the thing for my Epi Les Paul Signature hollow body it really makes a sonic difference what strings I use. Sounds like the thing for slide too! Joe, have you tried the Labella flats? I’ve used the stainless steel flats on my basses, and they are very nice. I dislike the D’Addarios because the tension is too high, and they are too thumpy. I think the Thomastics are too loose feeling. The LaBellas were just right, and they are bright, but without that round wound ringing tone. I haven’t used them in years, but I have a set here waiting to go on a bass as soon as I make new pickups for it. I have not tried their guitar flats, but I’d imagine they are equally as nice. I used to use flats on my Gibson ES-330TD, but I forget what brand they were. I must say the auto tune I didn’t really like but this thing seems quite fun 🙂 for 1-man-band people I think it’s quite the match. Although it seems there might be a bit of a learning curve… How is it the learning of actually using it and making some good sound? Well, the product was definitely designed to appeal to players of all levels. I’m trying to do lots of tricky stuff in the video with the live looping and all, but in terms of just getting your guitar to send a MIDI signal to your computer, it’s pretty simple. The sound quality is up to you — the pickup tracks great, so it really comes down to the quality of the virtual instruments you’re using. The factory library is based on the bundled plug-ins: Komplete Elements (the light version of Native Instruments’ Komplete, which includes sounds from Kontakt, Guitar Rig, and Reaktor), SampleTank 2.5 XL (a light version of IK Multimedia’s SampleTank 2.5 sampler), and IKM’s AmpliTube Custom Shop (the light version of AmpliTube 3). It’s not a comprehensive library, but there are many really nice sounds in it, and for some users, that’s all the content they’ll need. But obsessive geeks like me are likely to want to integrate TriplePlay with their own sound libraries. Playing-wise, it depends what you want to do. It’s definitely n00b-friendly. When I was demoing it at MacWorld, I took off my guitar and handed it to dozens of players of all ages and skill levels. Little kids who only knew a few chords would light up in smiles when they strummed a D chord and heard a string quartet. On the other hand, an experienced player trying to refine a super-realistic simulation of an acoustic instrument or concoct some cool new guitar-synth hybrid sound can easily vanish down the rabbit hole. BTW, TriplePlay also comes with Progression (the guitar-centric light version of Notion notation software) and Presonus Studio One 2, a full-featured DAW. I have a GR55 which collect dust. Seeing this inspired me to get it back out and try to record something on it. It works ok for somethings but trying to get a piano out of it appears to be beyond my playing abilities. Is that a problem here, too? I’m thinking I should just learn how to play piano already. Well, there are two aspects to getting a good piano sounds: The samples, and the playing technique. Piano sounds have come a long way in the last few years, and sampled pianos like Ivory and Imperfect Piano are stunningly realistic. (They’re HUGE though — many, many gigs of data.) You also have to play pianistically. For starters, that tends to mean fingerstyle instead of picking/strumming, and avoiding guitaristic gestures like bends and slides. Thanks Joe – I’m playing finger style, avoiding slides and bends, trying to be as piano-istic as I can. But I suspect my technique is just not up to it. Pads and bits of chords work out better. Will have to try the Fishman thing to see if it makes a difference with my level of technique. Actually found the problem – it was ghost notes caused by resting my palm on the strings out of habit. There’s a threshold setting on the GR55 to cut it out and cranking that up did the trick. Cool! Yeah, no matter how sophisticated the pitch-to-MIDI conversion is, you still have to be mindful about some of the guitar techniques that can confuse the system. You’ve got to play real cleanly and consistently! But no need to over-think it — just spend a few hours playing, and your hands and ears will start making the needed adjustments. Thanks for the demo. I’m really looking forward to this one. Very interesting ! Would you like to detail the hardware set up you used for the demo ? How to U manage the looper and the patch changes ? What kind of pedalboard are you using ? Sure! It’s a homemade Strat controlling instruments on a MacBook Air running Apple’s MainStage software. I’m using the same digital pedalboard I use in all my digital-guitar demos. It has a Ketih McMillen SoftStep controller pedal, which I use for patch changes and other realtime control. There’s also a Boomerang III looper pedal. The output from the audio interface (a Focusrite Scarlett) runs through the looper, and from the looper to … whatever sound system I’m playing through. In this case, I’m recording the results to a signal stereo channel in Apple’s Logic. Those are some amazing sounds! I guess an old Roland was the last synth I’d ever messed with, and most of the sounds were pretty lacking, at least when it came to aping conventional instruments like strings, pianos and whatnot. Maybe time to give this new stuff a try. Also, I saw Seven Psycopaths a few days ago and left thinking your old boss should write a song called ‘Tuesday Doesn’t Work For Me’. Using a guitar synth to realistically recreate other instruments takes a lot of thought and practice. I.E. you can’t play chords on horns and strings are usually limited to 2-3 note chords at most. Piano chords are a bit different than guitar chords as the notes are clustered closer than many guitar chords. Strings are also fretless so you need set the synth for continuous note vs chromatic settings. You need to do bendy stuff or play on a fretless guitar to really sound like a cello or violin. Pads and synth sounds are similar but keep in mind if you want to sound like an analog synth it is one note at a time. There are some players I have seen that are quite good at these imitations but I am sort of so so at it when I rarely choose to do so. For me guitar synth is about more sounds and tones rather than recreating instruments. I like layering sounds and many of my patches on my old GR30 were highly modified from the originals. My GR55 patches are starting to get those mods as I play it more and I use the VG sounds a lot as well (processed hex audio sounds without midi conversion). There is a pretty good free librarian program that works well at modding sounds and saving them as backups. I used a similar program for my GR30 and it made manipulating the patches very easy. There is a lot of program-ability available that most users never touch. I also use the GR30 as a parallel synth for one band I am in which I use a GKP-4 which gives 4 13 pin outs from one 13 pin input. I also use Roland WP-20G and OC-20G to fatten things up there are also new versions of these pedals that are just no hitting the stores no midi conversion so there is no need for learning a curve playing wise. Still waiting for this to actually hit the shops, but I wonder if it is really any better than all of the others that went before. You see demo’s , nice work by the way Joe, but in what way is the triple play any different to any other midi converter in practical terms (other than wireless) ? Like you point out Joe technique for playing midi guitar is really the key get right and an old Axon will do just fine, no? Still waiting for this to actually hit the shops, but I wonder if it is really any better than all of the others that went before. You see demo’s , nice work by the way Joe, but in what way is the triple play any different to any other midi converter in practical terms (other than wireless) ? Like you point out Joe technique for playing midi guitar is really the key, get that right and an old Axon will do just fine, no? Hi Dags! I’ve never used the Axon system, so I can’t offer a performance comparison. The main technological differences seem to be: wireless, no 13-pin connector, no external encorder/interface hardware, easier and less intrusive installation, lots of bundled third-party software, and a software component that can host any VST plug-in, or run as an AU or VST component within any current DAW. And price: used Axon systems seem to be selling for substantially more than a new TriplePlay. What a wonderful thing. Seems to be ideal for solo gigs. As a charter member of the “belt-and-suspenders” club, should I expect to carry spares for any of this technology when gigging? Seems to me that the computer would be the weak link here. Will the Fishman system work with a synth sound module, sans computer? How minimal or cheap could one go when selecting a laptop for this system? No, the Fishman system is definitely intended for computer use, since its only means of communication with external devices is wireless USB. (One the data reaches your computer, however, it can control external hardware devices via MIDI.) If you want a computer-free setup, you’re probably better off with one of the other solutions. I’ve been playing onstage with a laptop for a couple of years, and while I’m addicted to it, it’s a huge bummer in many regards. One thing I’ve been experimenting with is the idea of keeping the computer offstage and communicating with it wirelessly via an iPad or iPad Mini running remote desktop software like Splashtop Remote. I suppose it depends what sort of interaction you like to have with the software during a performance. For me, it’s mainly as a visual reference (i.e., verifying that I’m on the right patch). So maybe that’ll work. My daughter recently went to a show for a band her friends were in at a bar. They used laptops and iPads extensively some of it interacting with wifi connected stuff. It all went wrong half way thru the show when someone was hacking there private network. They apparently used an Android based smart phone to enter the network and also had a couple of other devices doing some sort of DOS attack that used up a lot of the network resources prior to the capture of the network. They since upped the security of the network and have no further problems. The lesson appears to be heavy security and a backup plan. They have a disgruntled former band member and possibly other enemies but it could just be a playful hacker type. It is also possible that it came from a nearby business or apartment. I don’t know how common this is as I have never heard of another case but It maybe more common than we know. I must admit there was a time in my young life when this may have been appealing to me but the tech was not there yet. I was a bit of a political freak that liked the idea of throwing rocks into the machinery of the state. Dang iPad and it’s suggesting words without me asking for it. I need to turn that feature off! I expect the user interface to be a bit snappier and I expect real time adjustments (the Axon did this the GI did not). Everybody seems to be hailing this as the Holy Grail of midi guitar, for example claiming on the one hand unparalleled accuracy and tracking and on the other that it is more forgiving of different styles (euphemism for poor technique) how can it be both? The absence of the 13 pin cable is no great advantage really, (no cable at all would be) it still needs a cable albeit a lighter one, I have yet to speak to someone who is considering one of these that does not already have all the software they need and more, not needing a small interface is a benefit but in the profusion of gizmos not a great one, so really it must all hinge on performance and ease of use and I have yet to hear a report that evidences that this is the case, is it just more of the same in a new suit?. Everyone just marvels at the fact that you can play the trumpet with a guitar which has been the case since the 80s. Where and when are we going to see some real information on this, a full test, a good look at the interface and features. 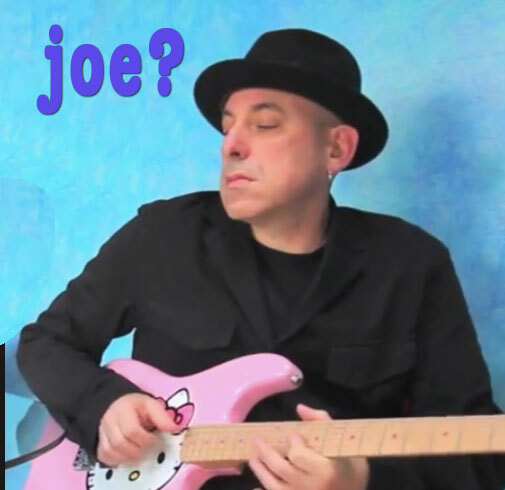 I mean no disrespect Joe your demo is great as is your musicianship, but I still just know its a pitch to midi converter and not much more. Hi Dags — again, I can’t address direct comparisons, because it’s been a long time since I used any of the rival systems. But I noticed immediately that you don’t need especially strong technique to get decent sounds from TriplePlay — basic “cowboy chords” work great. You’re right — being able to trigger a non-guitar sound isn’t exactly a fresh idea, though it does continue to amaze people who haven’t experienced it before. And you’re also right when you point out that this is really just a pitch-to-MIDI converter. It just happens to be a really smart, well-performing, highly customizable one that’s smaller, lighter, and less expensive than any previous systems, and which comes bundled with a ton of third-party software. I should add that one of the biggest inducements for me has nothing to do with TriplePlay itself, but rather with the huge strides we’ve made in digital tone production. Early Roland synth sounds were cheesy. TriplePlay sounds as cool as your soundware and sound-design skills permit. The Mac version is promised for this quarter, which means by March 31st. You probably won’t see much in the way of full-depth reviews before then. So it would seem that the Triple Play really is claiming to be more tolerant while remaining accurate. Can you use the TriplePlay with a Bass Guitar??? 1. The Guitar/Mix/Synth switch and the fact that versions of Guitar Rig and Amplitube are included suggest that guitar sounds can somehow bee transported wirelessly over the FTP. Does the pickup actually transmit the sound of the guitar wirelessly, which can then be processed on the computer separate from the MIDI data? 2. Have you had an opportunity to see how it interacts with an iPad? If so, would you be kind enough to describe that interaction? Thanks a lot. I’m very interested in this product, and frustrated that so little real information is out there about it. Nope, as explained in the video, your audio guitar signal is NOT transmitted wirelessly. The bundled amp modelers are for blending your MIDI and audio sounds in the TriplePlay mixer. There are channels for your synths, and another for guitar audio. But you have to plug in. Fishman isn’t directly supporting iDevices, because Apple makes no promise that iPhones and iPads will continue to support audio input via the Camera Connection kit. Right now, it DOES work, despite the fact that there’s no TriplePlay app for iOS. You can just plug in with the aforementioned adapter and play iOS virtual instruments — but only in mono mode (i.e., via a single MIDI channel), and not with any guitar audio. I guess I still don’t understand, then, what the Guitar/Mix/Synth switch is for. I defintely understand that the guitar’s native pickup sound is not transmitted, and cannot even be somehow input into the FTP controller ( as can happen on the GK controllers from Roland). But, if the FTP can only transmit MIDI, the why even have that switch? At the very least it seems to suggest that the FTP pickup impulses might be transmittable by the controller. What happens when that switch is all the way to guitar and, for example, you have Amplitube open on your computer? You hear nothing of what you are playing coming through Amplitube? I have to admit I find that switch intriguing and puzzling. 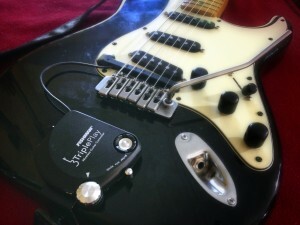 It seems like a perfect way to make the guitar completely wireless for both guitar work and MIDI work. I really appreciate your willingness to share and advise on this. Excellent question! The switch mutes channels within the TriplePlay software. There are five synth channels, and a single channel for guitar audio input. When you select the switch’s synth position, the guitar channel gets muted. When you choose the guitar position, the synths are muted. In the mix position, you hear everything. You could get the same result by turning down your guitar’s volume knob, or turning down the synth output. But this arrangement lets you that with a single switch. Thanks, Joe. Although it’s not the asnwer I wanted to hear, it makes sense, and I appreciate you taking the time to keep us all informed. I wish the danged thing would become available. I’ve got two Musicians Friend gift certificates burning a hole in my gig bag. Aww, thanks, Dude. Feel welcome to hang around and . . . abide. Thanks for the great demo and info Joe. I use a Roland GI-20 and it has less-than-perfect tracking but it does have dedicated jacks for sustain, hold and expression pedals. Is there a way to handle these pedals with the TriplePlay? Also, do you know of any plans from guitar manufacturers to have this technology built into their guitars? TriplePlay supports those pedals, but doesn’t include a hardware MIDI interface, so you’ll need to get those signals into your machine some other way. Godin is already building guitars with TriplePlay inside, and I suspect they’ll be joined by other manufacturers. Hope that helps! I’m really excited about how easy the Fishman is to install and remove. But I do have a question I hope you can answer. I understand that the Triple Play works as VST. But I want a native midi controller for instances where VST or AU is not an option. In particular I want something that can interface with Propellerhead Reason. Any thoughts? I have been waiting for for a wireless synth pickup for a while and I was always told that it would be too expensive to produce, being such a niche area. So good on Fishman for doing it. If the tracking is better and the fitting of the Fishman pick up is easier than the GK2 Roland thing I have, then I want one. However, the thought of dragging a PC out on the road scares me. I understand that a floor unit version is in the pipeline for later this year. Got any further news on this one? Hi Wadeal! The answer is “yes” to points one and two. And also, for better or worse, to the fact for now need a computer to use TriplePlay to its fullest. (Though you can also use it in “simple mode” with iPads, though you can’t combine synth and conventional guitar sounds within apps that way — which won’t stop creative musicians from doing cool things that way.) I can’t verify the plans or timetable for a floor unit, though many have expressed interest in the idea, and IMHO Fishman isn’t likely to ignore an eager potential market. I’ve played with a axon mk2, and the Roland pickup on my seven string guitar. I stuck the pickup on via dual suction cups that I took off from my shower curtain, and then stuck it on with some 3m double sided clear cushion type tape. Only problem is it came off once in a while and left sticky suction marks on my guitar. I had to do this cause the strap screw on my Ibenez was stripped. One of the 2 reason I got rid of this system is because it didn’t track well tuned down to A standard, for playing faster music. How fast do you think this system can track tremolo picking, before it gets messed up? The other reason was because I didn’t like being wired up, so I sold it too get a wireless cable unit from line 6. I really wanted the guitar to midi converter for imputing riffs into programs, like guitar pro. Any chance you have tried imputing riffs into programs like it, or used other programs first then imported them to guitar pro? I really would like to get a pickup that is seven string capable, but all I ever heard was that because of the 13 pin cable, you couldn’t get this to happen, unless Roland or some other company wanted to do it. Seems to me with the advent of wireless midi could there be a potential for adding 7 or more string wireless midi pickups. Have you heard any rumors of this possible happening down the road? Hmm It would be awesome if Graphtech had a ghost midi pickup wireless unit in the pipeline. Maybe these to could get together, help each other come up with a invisible wireless unit. I wonder if you could mod the Graphtech pickup saddles to the Fishmen body pack. Seems like it would just be a matter of figuring out which wires to connect. Well, the short answer is a) it probably tracks a little better than anything you’ve tried, but b) it’s still entirely possible to “freak it out” with certain guitar gestures. Wow — interesting idea! I wonder too. Just purchased one but having a tough time fitting it under any of my stratocasters. I either have to adjust my neck/bridge (I have my bridge set flat, so maybe floating it would help?) or cut out part of the pick guard on a beater guitar and sit it directly on the wood. I even tried to slide it under without the plastic clip below and that did not work. Did you have any issues trying to install yours? It seems like a start install should not be this tough! Great video, btw….I can’t wait to get rolling with this thing. Hi Kiel! Glad you dug the videos. They were fun to make. Yes, Strats can be a little tricky with TriplePlay, because the amount of clearance between the top and the strings varies substantially from model to model. I’m told the pickup fits right away with most new Fenders, but some older ones (or new ones with vintage dimensions) require you to shim the neck to add a little height. That’s what I had to to with the black “parts Strat” seen in my TriplePlay videos. It’s a 20-minute job if you’re comfy working on your guitar that way, and if you’re not, any decent tech can do it for you, and it shouldn’t cost very much. I know Larry Fishman worked really hard to get the pickup skinny enough to fit on all Strats without adjustment, but he told me he just couldn’t reduce the dimensions any further without compromising the performance. The shimming is kind of a pain, but as I can attest, once you do it, it works great and you don’t have to fuss any further. 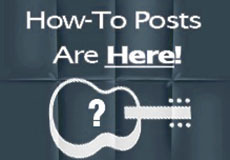 BTW, Fishman is creating an installation guide to be distributed to guitar techs, covering tricky install situations. I’m not sure if it’s out yet, but Fishman tech support can give you more info. Thanks for an explanation. And what is the material of your shim? Does it cover the whole surface of neck heel or only a half or third? Doesn’t it effect the sound of guitar (sustain, EQ) much? Well, the quick and dirty method is just to cut a strip of business card — it’s about the right thickness. But I’d get a more “pro” wooden shim, which you can order from a guitar supply company like Stewart-MacDonald. Or just take it to a guitar shop — it’s a real easy job that shouldn’t cost much. BTW, Fishman offers an advanced installation guide for guitar technicians, with more info than is included in the basic online manual. Just phone Fishman tech support and tell them you’d like a copy. hey! thanks so much for providing all this info. there’s not a ton out there on this little guy yet, so it’s most appreciated. i realize you may not be familiar with ableton, but this information is virtually impossible to find without buying it and trying it myself! I love Ableton, but there hasn’t really been room for it in my life since a became a Logic developer a few years ago, so I havent spent much time with the last few versions. But basically, yes — it should work. I don’t know whether you can directly switch patches within TriplePlay, but at the very least you could save multiple instances and switch between them within Live. Which I think would get you the results you seek. Hope that helps. yes! i think you’re right. thanks. Taking a look at the available guitars I would put this on, I’m surprised how little room is available between current bridge pickups and the bridge. Would you say a strat or copy is the best bet? I feel a bit silly buying a cheap strat to dedicate to the triple play? I suppose I could borrow back my strat I loaned out to a friend a few years back. Not knowing which guitars you own, I can’t say whether you need to purchase a dedicated guitar. But IMHO, the easiest, fastest, and least intrusive way to install is using the metal mounting bracket that fits over the tune-o-matic style bridges on Gibson and Gibson-influenced guitars. If I were to buy a guitar specifically for synth use and wasn’t attached to the sound of a Fender, I’d definitely opt for a guitar with a tune-o-matic. TriplePlay tends to fit easily on most modern Strat. However, on some vintage-stle strats (such as the black one I play in some of my TriplePlay videos), it’s necessary to shim the neck to get sufficient clearance between the strings and the guitar top. This is never an issue with the tune-o-matics. Hey Joe. I enjoy your playing and your writing. I am excited to get my hands on a TriplePlay, but in Cape Town – at the bottom of Africa – it will probably take another year before any suppliers will know what I’m asking for! Thanks for reading, Stu! Wow — is there really that kind of supply lag in this day and age? Is there a trick to get the bridge height high enough to not buzz the strings on the tripleplay pickup? Also for some reason I can’t download the software to my ipad, any ideas? Alright I read your post on how to shim the neck, thanks. Love your playing btw. Hi Gene — yes, the shimming can be a pain. But if you’re not confident doing it yourself, it should be a really inexpensive guitar shop job. Actually, there is no dedicated TriplePlay software for iPad. But you should be able to trigger music apps on your iPad provided you have the right adapter to accommodate the USB dongle. Joe, I can’t get FTP to work as a plugin in Logic Pro 9 or Mainstage 2. Can you walk me through the setup? Funny you should ask! I was just talking to Larry Fishman, who mentioned that a) they encountered some problems with FTP in Logic, and that b) a fix was coming soon. Have you updated to the newest software for all products? I heard that from Frank @ Fishman today. He also mentioned about a Logic setup check sheet (yet to come). I’m all updated. I really want to be able to loop in Mainstage like you do. I even have a KMI Softstep! But I’m more of a right-brainer and not so much a techie. (Even the Softstep is a challenge!) Would you consider doing a tutorial? I have the FTP – For WINDOWS I found it was imperative that you do the installs in order (plugin & patches first) and then the tripleplay controller interface last. A few things that bug me: They should allow you to install it on a 32-bit system – my ProTools 8.05 runs on an XP computer like a brick – but I can’t use the tripleplay software because it requires Windows 7. So I put it on my work desktop – took me two hours to get it working. Did anyone else have problems with the ISO files for the plugins? I HAD TO burn them to DVD to install them until I found a 3rd-party app called Daemon-something. I then had to download updates for all the plugins and the TP app, even firmware update. Be sure to start charging the transmitter first. However, on my laptop, which I loaded second, in order, I had it up & running in a matter of minutes – but by then I had all the software downloaded as well as the app to load the plugins. The smallest amount of latency I have found is about 1.5 milliseconds. For fast songs played live this is still too long. I think it is imperative that they find an easy way to use sound modules instead of computer plugins. I understand that putting much of the processing power on your computer lowers the price – but relying on a computer for live gigs is unworkable. I have had problems with stuck notes, or non-loading sound drivers (ASIO4ALL is also another mandatory download for Windows) and other glitches that would make it unusable for live. In any case I would really like to find a way to run a sound module with it. I have seen some recommended units that have USB inputs (most midi keyboards are USB these days, so it should not be a stretch to find the hardware so no computer is needed). If THAT reduces the latency to next to nothing then we have a HUGE winner here. Hi Paul — wish I could offer more advice, but really Windows is a Great Unknown for me. Are you sure you mean 1.5 milliseconds? That’s not much latency! Theoretically, Triple Play does support external sound modules. Were you not able to get that working? For me the latency has never really been an issue after playing a modern guitar synth for a while. It is very easy to adjust to the latency and play the notes slightly early to compensate, it has never been a problem even on an open low E or dropped D. There were many guys that used the earlier Roland stuff like the GR-1 which had a very audible latency but one of the players in The California Guitar Trio used one for years and nobody could fault their timing chops (they were graduates of Robert Fripp’s Guitarcraft school just to jog your memory). It is not much different from playing thru a backline amp on a large stage for instance. Try playing your guitar wirelessly to an amp and walk to the back of a club even solo it is easy to adjust for the lag time(latency) it takes for the sound wave to travel over the distance. There are far worse things than latency in guitar synths like false triggering and ghost harmonics for instance as well as finger noise artifacts on the strings. Latency is just not that big a deal compared with all the things we deal with using an electric guitar, pedals and amps. As for modules there is one called a Roland GR-55 that works really well and it has the VG engine to boot. If you mix the synth, VG and normal guitar sound together you will never notice latency even in a “fast song”. Heck I used to play Spike Jones “in Der Fuhrers Face” in a band live and it is breakneck speed in some places no problem with my Roland GR-30 synth with no guitar signal mixed in the latency was easily corrected for in my playing slightly ahead of the beat but it was an unconscious correction that I never had to think about. IMHO latency is more for sales literature and internet trolls looking to slam guitar synths. It is important to setup the midi pickup physically and electronically especially making sure the pickup is mounted well if it moves around it causes a lot of odd artifacts especially if you get worked up playing live. Hey Joe! Can you give me some details about the RAM memory? and which procesor does your computer have? and which type of hard disk do you have? Do you think this system can be used to play live? Hi Diego! I’ve been playing live with it for the last year and a half, using a recent model Mac Pro. I suspect it runs fine on most modern laptops. My computers happen to have a great deal of RAM in them, but I believe you need an especially large amount to get good results. TriplePlay works great live — it’s extremely reliable, and data errors are almost non-existent. However, performing on laptop is a huge adjustment for most players. It took me years to get used to it, and I still curse the stuff every time I play. Just make sure to get plenty of practice before you do it in public. Did you ever get around to trying the Trippe Play on a fender VI bass? I am considering that as an option and after speaking to Fishman directly, no one could give a concrete answer. No, thanks for reminding me! I don’t think it’ll be optimal, give the wider string spacing, but I dunno — maybe it’ll work. I’ll get on it.